1. Which browser should I use to view Bloodstock Evaluator? 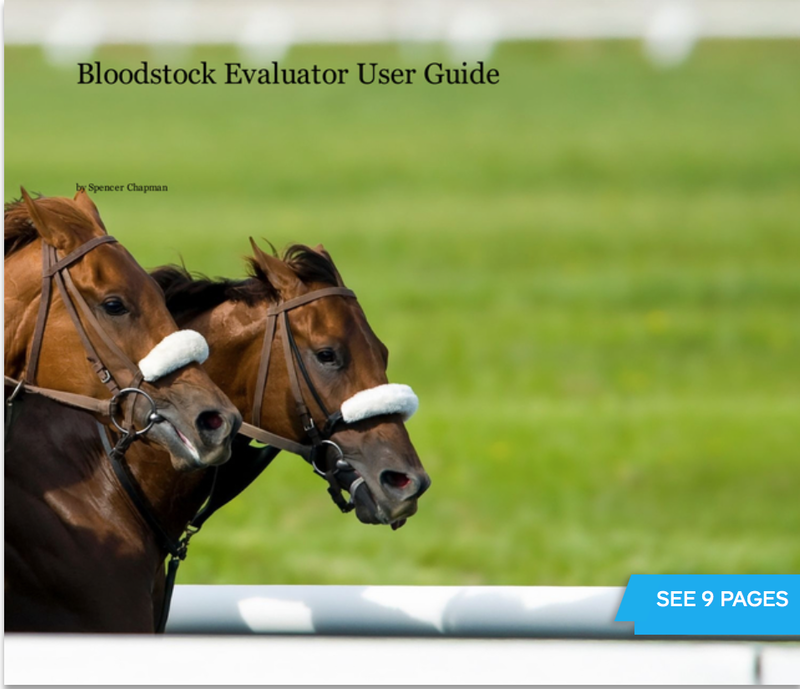 Bloodstock Evaluator is optimised for use in Google Chrome. It is fully functional using Mozilla Firefox and Apple Safari. It does not perform all functions in Internet Explorer. 2. What services does Bloodstock Evaluator offer? Bloodstock Evaluator offers users the ability to browse a database of over 2 million horses and 300,000 races. Click through pedigrees, race summaries and individual race results for all horses to have raced in the UK and Ireland, and the majority of Group or Graded stakes performers in Europe and North America since 1991. Datasets for the rest of the world will follow soon. This comprehensive database of pedigrees and race results powers both our Pedigree and Genetic Nicks, Sales Reports and the Timeform Tree. 3. Is the database error free? With such an enormous database we can’t guarantee this, although we are screening for errors all the time. We would be very grateful to hear from you if you do spot an error. Please email the team at [email protected] with the details. 4. The horse I’m interested in is not in your database. How can I add it? This is no resource yet for user-entered data. However, our team works pretty much around the clock, so please email us at [email protected] with the name and pedigree of the horse, and we will add it to the database. 5. What is the difference between Pedigree and Genetic Nicks? Pedigree Nicks score the “off paper” relationship between Sire and Dam Sire; Genetic Nicks look for and score the affinity between the Sire and the mitochondrial haplotype of the dam. 6. What is a mitochondrial haplotype? A mitochondrial haplotype is a female family. A small part of the DNA of animals, the mitochondrial DNA (mtDNA), is stored outside of the nucleus of a cell. This mtDNA is transmitted from mother to daughter without the recombination that characterizes nucleic DNA; a daughter will have the same mitochondrial genes as her mother, and grandmother before her. 7. What is mitochondrial DNA? Although most DNA is packaged in chromosomes within the nucleus, mitochondria also have a small amount of their own DNA. This genetic material is known as mitochondrial DNA or mtDNA. Mitochondria are structures within cells that convert the energy from food into a form that cells can use. Each cell contains hundreds to thousands of mitochondria, which are located in the fluid that surrounds the nucleus (the cytoplasm). Mitochondria produce energy through a process called oxidative phosphorylation. In addition to energy production, mitochondria play a role in several other cellular activities. For example, mitochondria help regulate the self-destruction of cells. They are also necessary for the production of substances such as cholesterol and heme (a component of hemoglobin, the molecule that carries oxygen in the blood). 8. What relationship are you scoring in the Nick analysis? Our nicking algorithms work in layers. At their simplest they score the relationship between Sire and Dam Sire (Pedigree), or Sire and the genetic family of the Dam (mtDNA). The algorithm searches for good horses within these relationships. Once it has found two Group Winners within a minimum of five good Black Type Performers, the algorithm stops searching and records the result of the nick. If it doesn’t find enough good horses on one level it moves on to the next, until every conceivable combination of Sire and Dam Sire line has been exhausted. The algorithm for Genetic Nicks plots less complex layers of relationships. Starting with the Sire and mtDNA of the Dam, through Grandsire, Great Grandsire etc. 9. Which horses do you count in the Nicking products? The horses which qualify in our nicking algorithms will have won a Group Race or Graded Stakes, or a Listed or Stakes Race. In addition, they qualify if they have finished second or third in a Group or Graded Stakes, or failing that, have a Timeform Rating of 105 or higher. 10. Are the Nick Ratings global? Our Nick Query has a Hemisphere or Continent filter. The default query which is applied to Sales Nick Reports will cover race results and Timeform Ratings for horses in the Northern Hemisphere. 11. How many Nick Ratings achieve the maximum score? The Nick Ratings are on a scale of 0 to 99 out of 100. Every score is rounded down to the nearest whole number which makes a score of 100/100 impossible. Our theory is that the nick scores are normally distributed and so fall into a predictable pattern. The best scores are only achieved by the top 2.5% of the population of all nicks. 12. Why do you show RC% in the nicking reports? The Relationship Coefficient (RC%) gives you an idea of how closely related the subject of the nick is to the good horses in the nick result. This can vary widely from 50% for an own sibling, all the way down to 1 or 2% for horses sharing distant ancestors. Our algorithm does not weight the RC%, but we advise users to pay attention to it when evaluating the nick. 13. What is an RC%? An RC% is the Relationship Coefficient between one horse and another. It is not a genetic measurement, but an expression of the statistical likelihood that any two horses will share the same gene or genetic traits inherited from a common ancestor or ancestors. The more common ancestors a pair of horses share, and the closer they are in a pedigree, the higher the chance of commonality. 14. Why do you calculate the Expected Result in the Nicking Query? It’s important to put a nick result into context. If it produces a good result of say 15% good horses to RAO, how significant is that, and how likely is it that the result could be reproduced by random chance? Comparing the nick result against the Expected Result allows us to bring that into context and produce an Odds Ratio which compares the two scores. 15. How is the Expected Result calculated? The Expected Result is drawn from a random dataset of horses in the Bloodstock Evaluator database foaled between 1996 and 2014. The random dataset is redrawn every time we update our database. Any duplicate horses present in both the query result and the expected result are removed from the expected result, leaving the datasets distinct. Our algorithm then sorts the dataset by the RC% with the subject horse. Finally, the algorithm works through layers of RC%’s (12.5%, 10%, 7.5% etc.) until it finds our defined number of quality horses. The Expected RAO is the number of horses taken to produce the quality horses. 16. How are the Nick Ratings calculated for unproven sires? The calculation of the Expected Result allows us to produce distinct ratings for unproven sons of good stallions. In this way they give a truer reflection of the quality of the nick, and do not assume that an unproven stallion will have the same effect on the nick as his proven sire. 17. What is an Odds Ratio? Odds can be used to express the likelihood of an outcome. In betting terms, we are familiar with odds of evens as implying a probability of 0.5, for example, and 3-1 as implying a probability of 0.25. The probability we are interested in the nicking report is the likelihood that horse with a specified nick will achieve GW&PL status on the racecourse. An odds ratio expresses this probability compared with that of a randomly selected sample (the Expected Result). Odds ratios greater than one indicate increasing likelihoods of success compared with random expectation. 18. What is a normal distribution curve? Many natural measurements tend to be distributed in a characteristic symmetrical bell-shaped pattern. The properties of this ‘normal’ (or Gaussian) curve are well known, and allow us to assign precise probabilities to the chances of observing any particular value. The majority of observations are clustered around the mean. The ‘tails’ at either end indicate the scarcity of values far from the mean. The odds ratios for a horse achieving GW&PL status compared with a random sample of the population are distributed in this way. 19. What does the chart represent in the reports? The chart represents the distribution of odds ratios. Observations in the lower and upper ‘tails’ of the curve are where the nick is performing unusually poorly or well by comparison with the population. 20. What does the flash horse represent in the charts? The flash horse is located at the point in the distribution where the nick in question is located. If it is central, its performance is average. If it is out on the right tail, the nick’s past performance has been better than expected compared with the population – horses with this nick are more likely to achieve GW&PL status. 21. What is a z value? A z value is a metric which can be used for defining the precise probability that an individual horse with a specified nick achieves GW&PL status. It takes account of the size of the dataset in both the query and the expected result, so effectively weights the rating according to the number of RAO produced by the nick. Values above (or below) approximately 2.0 indicate a statistically significant observation. 22. What are the Sales Reports? There are three types of Sales Reports, Pedigree and Genetic Nick Reports and the Timeform Tree. Bloodstock Evaluator will offer these reports initially for most of the Bloodstock Sales in England, Ireland and France, and for select sales in Germany, Italy and USA. 23. What is the Timeform Tree? Bloodstock Evaluator and Timeform have produced a new tool to help bloodstock professionals and customers of the major Sales companies evaluate the likely racing merit of an unraced thoroughbred - the Timeform Tree. These reports currently combine Timeform ratings with unique analytic genetic input from Bloodstock Evaluator. A brief stallion performance summary. A stallion progeny median Timeform rating summary by age and distance category. A list of 10 ten lifetime performers by the stallion with ratings by age and distance category. Timeform comments for the leading runners by the stallion in the last year. A female family median Timeform rating summary by age and distance category. Leading runners from the female family in the last year listed under the first three dams. Timeform ratings where available for all runners in the first three generations of the female family. An at-a-glance summary of how the runner fared on the racecourse. A 10-generation inbreeding coefficient* for all horses from the female family. * The inbreeding coefficient is a measure of the number of common or repeated ancestors in a pedigree, expressed as a percentage and represents the average chance that any one gene pair is identical due to inheritance from a common ancestor. 24. How do I subscribe? Subscribe by buying credits at www.bloodstockevaluator.com/Pricing or follow the links SUBSCRIBE -> Buy Credits. The credits are arranged in packages. The more you buy, the more you will save. Your credits will never expire. 25. How do I nominate my stallion/s? Please go to www.bloodstockevaluator.com/Pricing/NominateStallions, choose your plan and fill in the contact details. Alternatively contact Spencer Chapman on +44 7736 072203 or Henrietta Egan on +353 86 79 33554 to discuss your options and how we can help you. 26. How do I sign up for the Newsletter? Subscribe either on the News page by filling in your email address in the box provided, or by checking the “Sign up for daily newsletter” box on the Registration page.